The narrow channel that splits Turtle Rock. 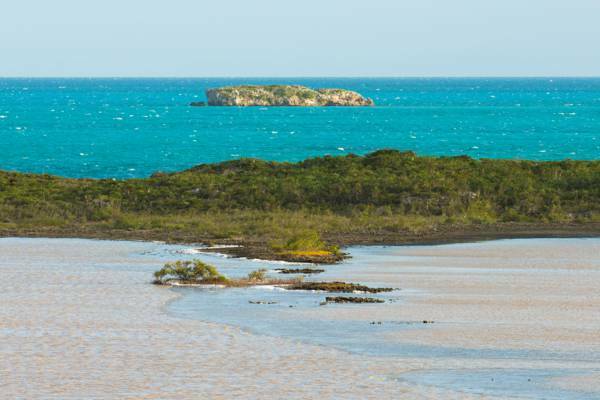 Turtle Rock is located one mile (1.6 km) off the coast of Providenciales near West Harbour Bluff (within the Frenchmans Creek and Pigeon Pond Nature Reserve). The rock is about 200 feet (65 m) wide, and much of it consists of exposed and weathered limestone rock. Small amount of low height and salt-resistant coastal vegetation can be found growing above the reaches of the ocean on the northern side. Turtle Rock displays quite a few interesting geological features. The island itself is split in half, with a small channel in between. The southern portion, due to being a bit more exposed, is is little more than limestone, and the larger northern half hosts the limited vegetation at the rock. As seen in other cases in the country, and as evidenced by sinkhole and other features still remaining, the presence of a Karst cave features likely contributed to the fracturing of the rock. Another element of many limestone cliff coastlines in the Turks and Caicos is wave-cut notches, which can be as deep as twenty-thirty feet (6-9m) in some cases. In combination with the weakening caused by the Karst features, the splitting of the rock was a natural outcome. The remote southwest coast of Providenciales as seen from Turtle Rock. 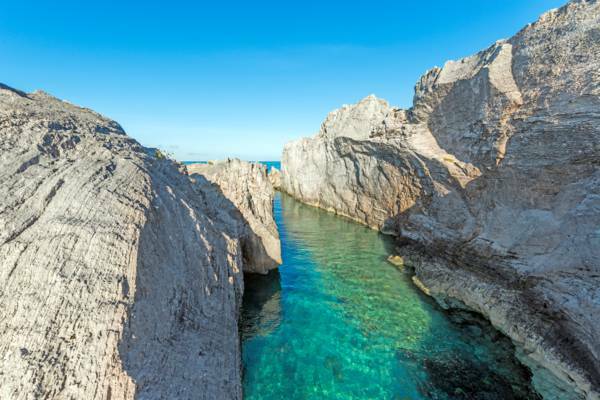 Turtle Rock, and its many surrounding broken pieces has created a fascinating geological snorkelling environment to explore, and provides a sheltered habitat for a variety of marine life. 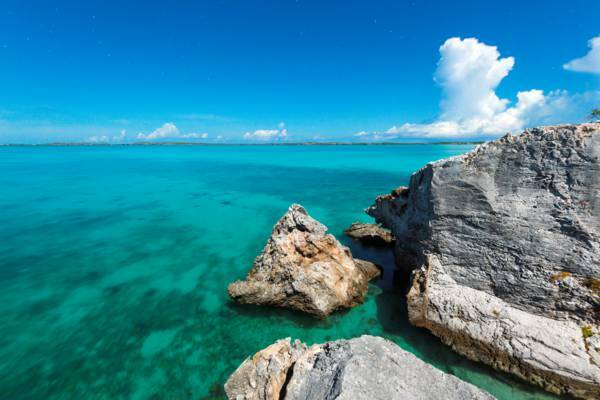 Due to being located out on the Caicos Banks, Turtle Rock is directly exposed to the typical eastern trade winds, and thus ocean conditions can often be a bit choppy. However, on a calm day, it’s a unique and interesting snorkelling site. Because of the collapse, the southern side of the rock has created many underwater overhangs and “caves”, and these features shelter fish of several varieties, crustaceans, and coral. West Indian spider crabs (Mithrax spinosissimus), seldom seen at other reef sites in the country, are common around the rock. A small shipwreck is another sight and is found less than 300 feet (90m) northeast from the Turtle Rock. The sea grass to the south of the rock, including an area that continues to the coast of Providenciales, is home to one of the strongest populations of West Indian sea stars (Oreaster reticulatus) near Providenciales. There are no scheduled tours to Turtle Rock. Some boat cruises that visit West Harbour Bluff occasionally make a snorkelling stop at the site, but it isn’t a guarantee. It’s possible to kayak the 1.8 miles (3km) to Turtle Rock from the Taylor Bay or Chalk Sound area of Providenciales, however we advise that only experienced and properly-equipped kayakers take this route. It’s crucial that paddlers monitor wind conditions. Typical wind direction is east southeast, and it may be difficult to paddle upwind and return to the launch point on a breezy day. Last reviewed by an editor on 17 November 2017.